For the stream in Montana, see Baking Powder Creek. U.S. consumer-packaged baking powder. This particular type of baking powder contains monocalcium phosphate, sodium bicarbonate, and cornstarch. Baking powder is a dry chemical leavening agent, a mixture of a carbonate or bicarbonate and a weak acid. The base and acid are prevented from reacting prematurely by the inclusion of a buffer such as cornstarch. Baking powder is used to increase the volume and lighten the texture of baked goods. It works by releasing carbon dioxide gas into a batter or dough through an acid-base reaction, causing bubbles in the wet mixture to expand and thus leavening the mixture. The first single-acting baking powder was developed by food manufacturer Alfred Bird in England in 1843. The first double-acting baking powder was developed by Eben Norton Horsford in America in the 1860s. Baking powder is used instead of yeast for end-products where fermentation flavors would be undesirable, where the batter lacks the elastic structure to hold gas bubbles for more than a few minutes, and to speed the production of baked goods. Because carbon dioxide is released at a faster rate through the acid-base reaction than through fermentation, breads made by chemical leavening are called quick breads. The introduction of baking powder was revolutionary in minimizing the time and labor required to make breadstuffs. It led to the creation of new types of cakes, cookies, biscuits, and other baked goods. Baking powder is made up of a base, an acid, and a buffering material to prevent the acid and base from reacting before their intended use. Most commercially available baking powders are made up of sodium bicarbonate (NaHCO3, also known as baking soda or bicarbonate of soda) and one or more acid salts. Monocalcium phosphate ("MCP") is a common acid component in domestic baking powders. A typical formulation (by weight) could call for 30% sodium bicarbonate, 5-12% monocalcium phosphate, and 21-26% sodium aluminium sulfate. Alternately, a commercial baking powder might use sodium acid pyrophosphate as one of the two acidic components instead of sodium aluminium sulfate. Another typical acid in such formulations is cream of tartar (KC4H5O6), a derivative of tartaric acid. In some jurisdictions, it is required that baking soda must produce at least 10 per cent of its weight of carbon dioxide. The use of two acidic components is the basis of the term "double acting." The acid in a baking powder can be either fast-acting or slow-acting. A fast-acting acid reacts in a wet mixture with baking soda at room temperature, and a slow-acting acid does not react until heated. When the chemical reactions in baking powders involve both fast- and slow-acting acids, they are known as "double-acting"; those that contain only one acid are "single-acting". By providing a second rise in the oven, double-acting baking powders increase the reliability of baked goods by rendering the time elapsed between mixing and baking less critical. This is the type of baking powder most widely available to consumers today. Double-acting baking powders work in two phases; once when cold, and once when hot. 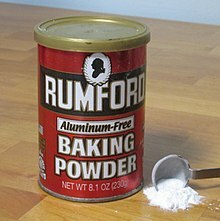 For example, Rumford Baking Powder is a double-acting product that contains only monocalcium phosphate as a leavening acid. With this acid, about two-thirds of the available gas is released within about two minutes of mixing at room temperature. It then becomes dormant because an intermediate form of dicalcium phosphate is generated during the initial mixing. Further release of gas requires the batter to be heated above 140 °F (60 °C). Common low-temperature acid salts include cream of tartar and monocalcium phosphate (also called calcium acid phosphate). High-temperature acid salts include sodium aluminium sulfate, sodium aluminium phosphate, and sodium acid pyrophosphate. Baking powders also include components to improve their stability and consistency. Cornstarch, flour, or potato starch are often used as buffers. An inert starch serves several functions in baking powder. Primarily it is used to absorb moisture, and thus prolong shelf life of the compound by keeping the powder's alkaline and acidic components dry so as not to react with each other prematurely. A dry powder also flows and mixes more easily. Finally, the added bulk allows for more accurate measurements. When Amelia Simmons published American Cookery (1792), the first American cookbook, the recipes she included used three possible types of leavening: baker's yeast, emptins (from the leavings of brewer's yeast), and pearlash. At that time, the mechanisms underlying the action of yeasts and other leavenings were not understood, and reliable commercial products were not available. Bakers obtained yeasts from brewers or distillers or made their own by exposing mixtures of flour and water to the open air. If lucky, they could capture useful wild yeast and keep some alive, regularly feeding it for ongoing use and trying to avoid contamination. Women who made their own ale could use the brewing dregs or "emptins" in their baking. The effectiveness of such leavenings varied widely. Resulting baked goods often had a sour or bitter taste. Breads were made of grain, water, yeast, and sometimes salt. Cooks also made yeast, sponge and pound cakes. Yeast cakes were similar to breads but included fancier ingredients, like sugar, spices, fruits or nuts. Sponge cakes used beaten egg whites for leavening. Pound cakes combined butter, sugar, and flour and eggs, and were particularly dense. Making cakes was even more laborious than making bread: to prepare a cake, a manservant might have to beat the ingredients together as long as an hour. The third type of leavening, pearlash, was the precursor to modern baking powder. Pearlashe was a purified form of potash. It was the subject of the first patent in the United States, issued on April 1790. Its preparation was time-consuming, but could be accomplished by a housewife with a cast-iron kettle: it involved soaking fire-place ashes in water to make lye, and then boiling the lye to remove water and obtain "salts". The active ingredient in pearlashe was potassium carbonate (K2CO3). Combining it with an acidic ingredient like sour milk or lemon juice resulted in a chemical reaction that produced carbon dioxide. Once prepared, the white powder was much more stable than yeast. Small amounts could be used on a daily basis, rather than baking a week or two weeks' worth of bread at one time. American Cookery was the first cookbook to call for its use, but by no means the last. With pearlashe, cooks were able to create new recipes for new types of cakes, cookies, and biscuits that were quicker and easier to make than yeast-based recipes. The chemical leavening effects were accomplished by the activating of a base such as baking soda in the presence of liquid(s) and an acid such as sour milk, vinegar, lemon juice, or cream of tartar. Because these acidulants react with baking soda quickly, retention of gas bubbles was dependent on batter viscosity. It was critical for the batter to be baked quickly, before the gas escaped. The next step, the development of baking powder, created a system where the gas-producing reactions could be delayed until needed. The creation of shelf-stable chemical combinations of sodium bicarbonate and cream of tartar is seen as marking the true introduction of baking powder. Although cooks had used both sodium bicarbonate and cream of tartar in recipes, they had to purchase the ingredients individually and store them separately to prevent them from spoiling or reacting prematurely. As chemists developed more uniform constituents, they also began to experiment with ways of combining them. In the mid-late 1800s, chemists introduced the first modern baking powders. The first to create a form of baking powder was English chemist and food manufacturer Alfred Bird in 1843. Bird was motivated to develop a yeast-free leavener because his wife Elizabeth was allergic to eggs and yeast. His formulation included bicarbonate of soda and tartaric acid, mixed with starch to absorb moisture and prevent the other ingredients from reacting. A single-action form of baking powder, Alfred Bird's Baking Powder reacted as soon as it became damp. Bird focused on selling his baking powder to the British Army during the Crimean War, and to explorers like Captain Sir Francis Leopold McClintock, rather than the domestic market. Nonetheless, Bird's creation of baking powder enabled cooks to take recipes for cakes such as the patriotically-named Victoria sponge and make them rise higher. He did not patent his discovery, and others such as Henry J. Jones (1812-1891) soon produced and patented similar products. In 1845, Jones patented "A new preparation of flour" that included sodium bicarbonate and tartaric acid to obtain a leavening effect. Horsford's research was interrupted by the American Civil War, but in 1869 Horsford finally created an already-mixed leavening agent by using cornstarch as a buffer. Rumford Chemical Works then began the manufacture of what can be considered a true baking powder. Throughout his career, Horsford continued to experiment extensively with possible techniques and preparations for baking powder. Horsford's leavening products were marketed originally as "Horsford's Yeast Powder" and later as "Rumford Baking Powder". They were packaged in glass bottles and later in metal cans. :36–44 In 2006 the Rumford Chemical Works in East Providence, Rhode Island were designated a National Historic Chemical Landmark in recognition of baking powder's impact in making baking easier, quicker, and more reliable. The preparation of baking powder by Professor Horsford in Cambridge in North America, I consider one of the most important and beneficial discoveries that has been made in the last decade. 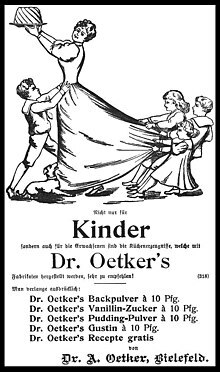 German advertisement for Dr. Oetker's baking powder in 1903. 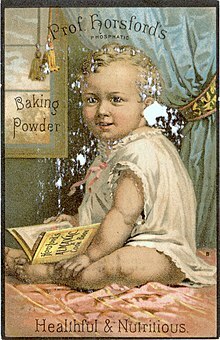 In the U.S., in 1866, Joseph C. Hoagland and his brother Cornelius developed a baking powder product with the help of Thomas M. Biddle. :70–74 They sold a single-action baking powder containing cream of tartar, bicarbonate of soda and starch. Their formula became known as Royal Baking Powder. Initially in partnership as Biddle & Hoagland, the Hoaglands moved from Fort Wayne, Indiana, to Chicago, leaving Biddle behind, and then to New York. They incorporated there as the Royal Baking Powder Company in 1868. Various battles for control ensued between the Hoagland brothers and their one-time employee William Ziegler. 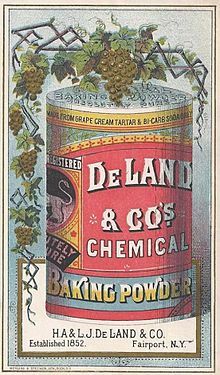 Finally, on March 2, 1899, Ziegler established the New Jersey-based Royal Baking Powder Corporation which combined the three major cream of tartar baking powder companies then in existence in the United States: Dr. Price (Ziegler), Royal (Joseph Hoagland) and Cleveland (Cornelius Nevius Hoagland). Cream of tartar was an expensive ingredient in the United States, since it had to be imported from France. In the 1880s, several companies developed double-action baking powders containing cheaper alternative acids known as Alums, a class of compounds involving double sulfates of aluminum. :68 The use of various types of alum in medicines and dyes is mentioned in Pliny the Elder's Natural History. However, the actual composition of alum was not determined until 1798, when Louis Vauquelin demonstrated that common alum is a double salt, composed of sulfuric acid, alumina, and potash. and Jean-Antoine Chaptal published the analysis of four different kinds of alum. One more type of baking powder was introduced during World War II under the brand name Bakewell. Faced with wartime shortages of cream of tartar and baking powder, Byron H. Smith, a U.S. inventor in Bangor, Maine, created substitute products for American housewives. Bakewell Cream was introduced as a replacement for cream of tartar. It contained sodium acid pyrophosphate and cornstarch and was labeled as a leavening agent. It could be substituted for cream of tartar or mixed with baking soda to replace baking powder. Smith also sold a baking powder replacement, in which sodium acid pyrophosphate was already mixed with bicarbonate of soda and cornstarch. Somewhat confusingly, it was marketed as "Bakewell Baking Powder" or "Bakewell Cream Baking Powder". Some packaging uses the phrase "The Original Bakewell Cream". A product labelled "Bakewell Cream" may be either the cream of tartar substitute or the baking powder substitute depending on whether it is additionally identified as "Double acting" "Baking Powder". A modern version containing acid sodium pyrophosphate, sodium bicarbonate and redried starch, is sold as being both aluminum-free and gluten-free. Over time, most baking powder manufacturers have experimented with their products, combining or even replacing what were once key ingredients. Information in the following table reflects the original ingredients as introduced by different individuals and companies. The ingredients used may be very different from later formulations and current products. Where an ingredient had multiple names, they are all listed together in the first occurrence, and the most common name listed thereafter. Effective baking powder foams when placed in hot water. Generally, one teaspoon (5 g or 1/6 oz) of baking powder is used to raise a mixture of one cup (120 g or 4oz) of flour, one cup of liquid, and one egg. However, if the mixture is acidic, baking powder's additional acids remain unconsumed in the chemical reaction and often lend an unpleasant taste to food. High acidity can be caused by ingredients such as buttermilk, lemon juice, yogurt, citrus, or honey. When excessive acid is present, some of the baking powder should be replaced with baking soda. For example, one cup of flour, one egg, and one cup of buttermilk requires only ½ teaspoon of baking powder—the remaining leavening is caused by buttermilk acids reacting with ¼ teaspoon of baking soda. However, with baking powders that contain sodium acid pyrophosphate, excess alkaline substances can sometimes deprotonate the acid in two steps instead of the one that normally occurs, resulting in an offensive bitter taste to baked goods. Calcium compounds and aluminium compounds do not have that problem, though, since calcium compounds that deprotonate twice are insoluble and aluminium compounds do not deprotonate in that fashion. Moisture and heat can cause baking powder to lose its effectiveness over time, and commercial varieties have a somewhat arbitrary expiration date printed on the container. Regardless of the expiration date, the effectiveness can be tested by placing a teaspoon of the powder into a small container of hot water. If it bubbles vigorously, it is still active and usable. Different brands of baking powder can perform quite differently in the oven. Early baking powder companies published their own cookbooks, to promote their new products, to educate cooks about exactly how and when to use them, and because cooks could not easily adapt recipes that were developed using different types of baking powder. Baking powders using cream-of-tartar, phosphates, or alums could behave very differently, and required different amounts for a desired rising effect. In 2015, Cook's Country, an American TV show and magazine, evaluated six baking powders marketed to consumers. In one test, six U.S. brands were used to bake white cake, cream biscuits, and chocolate cookies. Depending on the brand, the thickness of the cakes varied by up to 20% (from 0.89 to 1.24 in). It was also found that the lower-rising products made what were judged to be better chocolate cookies. Also, 30% of the testers (n=21) noted a metallic flavor in cream biscuits made with brands containing aluminum. As described above, baking powder is mainly just baking soda mixed with an acid. In principle, a number of kitchen acids may be combined with baking soda to simulate commercial baking powders. Vinegar (dilute acetic acid), especially white vinegar, is also a common acidifier in baking; for example, many heirloom chocolate cake recipes call for a tablespoon or two of vinegar. Where a recipe already uses buttermilk or yogurt, baking soda can be used without cream of tartar (or with less). Alternatively, lemon juice can be substituted for some of the liquid in the recipe, to provide the required acidity to activate the baking soda. The main variable with the use of these kitchen acids is the rate of leavening. Linda Civitello, Baking Powder Wars: The Cutthroat Food Fight that Revolutionized Cooking. Urbana, IL: University of Illinois Press, 2017. ^ Matz, Samuel A. (1992). Bakery Technology and Engineering (3 ed.). Springer. p. 54. Retrieved 2009-08-12. ^ McGee, Harold (2004). On Food and Cooking (revised ed.). Scribner-Simon & Schuster. p. 533. ISBN 9781416556374. Retrieved 2009-08-12. ^ a b c d e f g h i j k l m n o p q r s t u v w x y z aa ab ac ad ae Civitello, Linda (2017). Baking powder wars : the cutthroat food fight that revolutionized cooking. Urbana, Illinois: University of Illinois Press. p. 45,70–74. ISBN 9780252041082. ^ a b Brown, Martha C. (1981). "Of Pearl Ash, Emptins, And Tree Sweetnin' America's First Native Cookbook". American Heritage. 32 (5). Retrieved 22 January 2019. ^ a b c d Reisert, Sarah (2018). "Baking up a Storm: When crime and politics influenced American baking habits". Distillations. 4 (3): 46=47. Retrieved August 23, 2018. ^ A.J. Bent, ed. (1997). The Technology of Cake Making (6 ed.). Springer. p. 102. Retrieved 2009-08-12. ^ Branch, Legislative Services. "Consolidated federal laws of canada, Food and Drug Regulations". laws.justice.gc.ca. Retrieved 2018-07-19. ^ "Chemical Leaveners, Lallemand Baking Update, Vol. 1 No. 12, 1996" (PDF). Lallemand Inc. Archived from the original (PDF) on 2003-03-03. Retrieved 2009-03-05. ^ Lindsay, Robert C. (1996). Owen R. Fennema (ed.). Food Chemistry (3 ed.). CRC Press. p. 772. Retrieved 2009-08-12. ^ a b Corriher, S.O. (2008). BakeWise: The Hows and Whys of Successful Baking with Over 200 Magnificent Recipes. Scribner. ISBN 9781416560838. Retrieved 2014-10-25. ^ "Frequently Asked Questions". Clabber Girl. Clabber Girl. 2014. Retrieved 2014-03-29. ^ Matz, Samuel A. (1992). Bakery Technology and Engineering (3 ed.). Springer. pp. 71–72. Retrieved 2009-08-12. ^ McGee, Harold (2004). On Food and Cooking (revised ed.). Scribner-Simon & Schuster. p. 534. Retrieved 2009-08-12. ^ "The History Dish: Pearlash, The First Chemical Leavening". Four Pounds Flour. May 23, 2012. Retrieved 11 January 2019. ^ Stavely, Keith; Fitzgerald, Kathleen (January 12, 2018). "What America's First Cookbook Says About Our Country and Its Cuisine". Smithsonian magazine. Retrieved 24 January 2019. ^ Longone, Jan (2002). "Feeding America: The Historic American Cookbook Project By Jan Longone, Curator of American Culinary History, Clements Library, University of Michigan". Clements Library, University of Michigan. Retrieved 26 January 2019. ^ Stauffer, Clyde E. (1990). Functional Additives for Bakery Foods. Springer. p. 193. Retrieved 2009-08-12. ^ Edwards, W.P. (2007). The Science of Bakery Products. Royal Society of Chemistry. p. 73. Retrieved 2009-08-12. ^ a b c d e f "Development of Baking Powder: National Historic Chemical Landmark". ACS Chemistry for Life. American Chemical Society. Retrieved 2018-01-22. ^ Davidson, Alan; Saberi, Helen; Jaine, Tom; Davidson, Jane L. (August 21, 2014). The Oxford Companion to Food (2nd ed.). OUP Oxford. p. 55. ISBN 9780191040726. Retrieved 24 January 2019. ^ Chynoweth, Tessa (23 April 2018). "Birmingham Manufactures: Alfred Bird & Sons - Poles Apart". Birmingham Museums. Retrieved 25 January 2019. ^ Earle, Rebecca (October 27, 2016). "How to make Victoria Sponge the way Queen Victoria would have eaten it". The Conversation. Retrieved 25 January 2019. ^ Cloake, Felicity (16 May 2013). "How to make the perfect Victoria sponge cake". The Guardian. Retrieved 24 January 2019. ^ Hughes, Kathryn (2005). The Short Life and Long Times of Mrs Beeton. London: Fourth Estate. ^ Page, Frederick G. (2013). "BAKING POWDER AND SELF-RISING FLOUR (1) IN NINETEENTH-CENTURY BRITAIN: THE CARBON DIOXIDE AERATIONS OF HENRY JONES AND ALFRED BIRD" (PDF). Bulletin for the History of Chemistry. 38 (2): 140–154. Retrieved 31 January 2019. ^ a b c d Jones, Paul R. (18 July 2013). "Justus Von Liebig, Eben Horsford and the Development of the Baking Powder Industry". Ambix. 40 (2): 65–74. doi:10.1179/amb.1993.40.2.65. PMID 29185890. ^ "Dr. Oetker Baking Powder". Dr. Oetker. Retrieved 26 January 2019. ^ Royal Baking Powder (1942). A Guide to Royal Success in Baking (PDF). Standard Brands Incorporated. p. 4. Retrieved 26 January 2019. ^ Panko, Ben (20 June 2017). "The Great Uprising: How a Powder Revolutionized Baking". Smithsonian. Retrieved 20 June 2017. ^ Schwarcz, Joe (June 3, 2016). "The Right Chemistry: Why might baking powder contain aluminum or GMOs?". Montreal Gazette. Retrieved 29 January 2019. ^ "All About Bakewell Cream". Cook's Illustrated. January 2011. Retrieved 29 January 2019. ^ Oliver, Sandra; Standish, Marjorie (May 31, 2018). Cooking Maine style : tried and true recipes from Down East. Lanham, MD: Down East Books. p. 112. ISBN 978-1608939534. Retrieved 29 January 2019. ^ Jampel, Sarah (May 11, 2016). "Is This Ingredient the Secret to the Best Biscuits of Your Life?!". Food52. Retrieved 29 January 2019. ^ Pollard, Nancy (September 18, 2018). "A Gift Of A Better Baking Powder". Kitchen Detail. Retrieved 29 January 2019. ^ a b Savoie, Lauren (2015). "Taste Test: Baking Powder". Cook's Country (66): 31. ISSN 1552-1990. ^ "Baking Powder". Fine Cooking. Archived from the original on 1 February 2009. Retrieved 2009-03-06. ^ "Chocolate Cake with Vinegar - Antique Recipe Still Very Good". Cooks.com. Retrieved 2009-06-12. Cook's Thesaurus: Leavens Descriptions of various chemical leavening agents and substitutions. Baking Powder Contains list of aluminium-free baking powders available in the US.